Jun. 29, 2017 2:30 p.m.
Due to the efforts of the federal government, the provincial government and the City of Lacombe; along with the Royal Canadian Legion and the efforts of dozens of Lacombe citizens – the Field of Honour in the Lacombe Cemetery will soon be home to a Canadian Light Armour Vehicle III (LAVIII) to pay tribute to the 40,000 Canadian soldiers who served in Afghanistan and the 162 soldiers who lost their lives in service to their county. The last soldier who lost his life in Afghanistan was Lacombe resident Master Cpl. Byron Greff, who served in the Third Battalion Princess Patricia’s Canadian Light Infantry. Greff lost his life along with 16 others when a car packed with explosives rammed their armoured bus. Greff’s parents Candace and Greg Greff were on hand for the arrival of the LAVIII to the Lacombe Royal Canadian Legion Branch #79 on Thursday. MP Blaine Calkins (Red Deer-Lacombe) spearheaded the LAVIII project after hearing they were being made available throughout the country. Calkins and his staff worked together with all three levels of government, as well as the Legion and many other community groups and individuals to finally bring the vehicle to the community. The vehicle will be in the Lacombe Days parade on July 29th and members of the Armed Forces, the RCMP and many other groups have been invited to take part. The Greff family appreciated that the community came together to make this new memorial monument in the Field of Honour happen. Lacombe Mayor Steve Christie, who was on hand for the event, was overwhelmed with the community support for this project and was pleased they were able to pay tribute to Byron. “It shows the community pride that Lacombe has and this is just one more example. To be a part of it is so special,” he said. 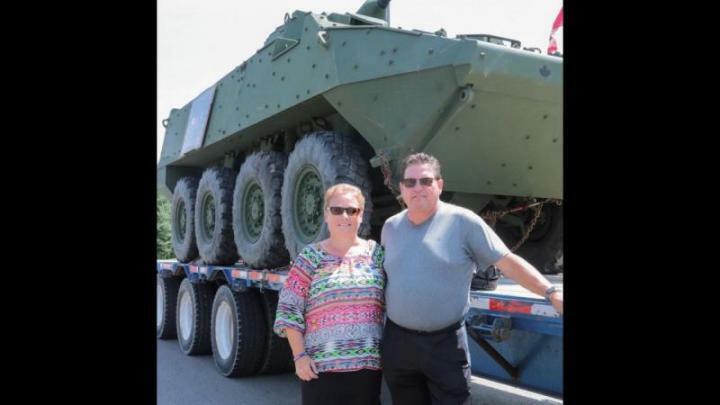 “Master Corporal Byron Greff and his family have been friends of ours since we moved to Lacombe. They were actually the first family that we met. He added his thanks for everyone who put time into the logistics of this project. “My thanks go to the committee and the people that spent endless hours on applications and making sure all the T’s were crossed and I’s were dotted. It was the right thing to do,” he said.